You know how sometimes when you have such an amazing piece of accessory, whether it be jewelry, watch or handbag, you style your entire outfit around it? That is exactly what I did here. I am so in love with my new watch from Christian Paul. The marble collection is absolutely stunning... 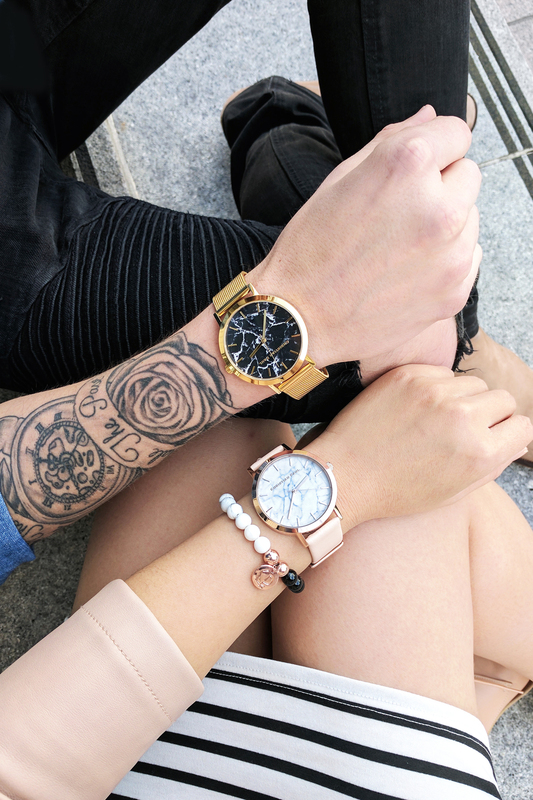 I have the Bondi Marble which is white marble with a blush leather band and Jeremy has the Brighton Marble which is black marble with a gold mesh band. I also have a matching howlite and onyx bracelet to go with it. 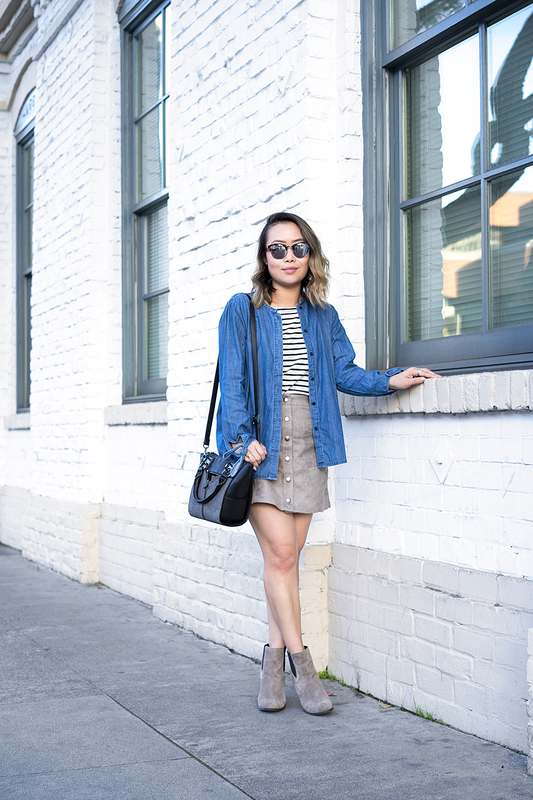 As for my outfit, I am wearing a striped tee dress from Azalea, a blush moto jacket by Bar III from Macy's and these lovely blush leather oxfords from Everlane. 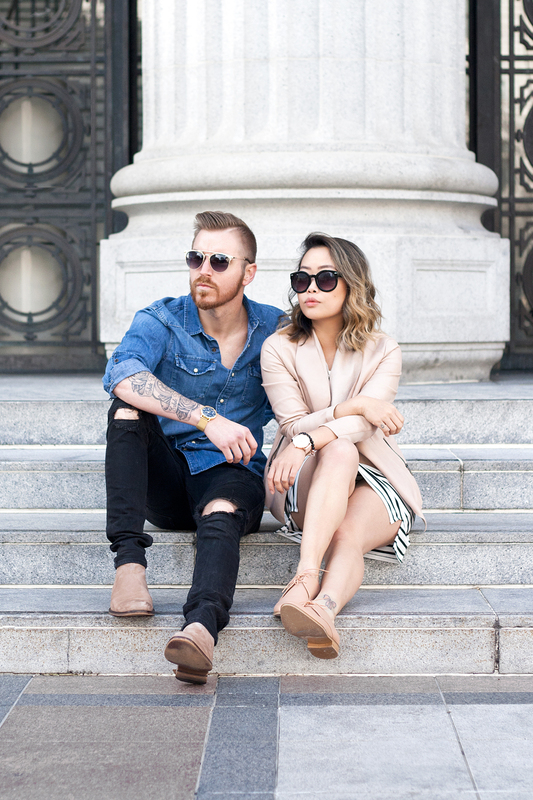 So excited to be showing you more his and her style soon! Bondi Marble watch c/o Christian Paul. Howlite and onyx bracelet c/o Christian Paul. 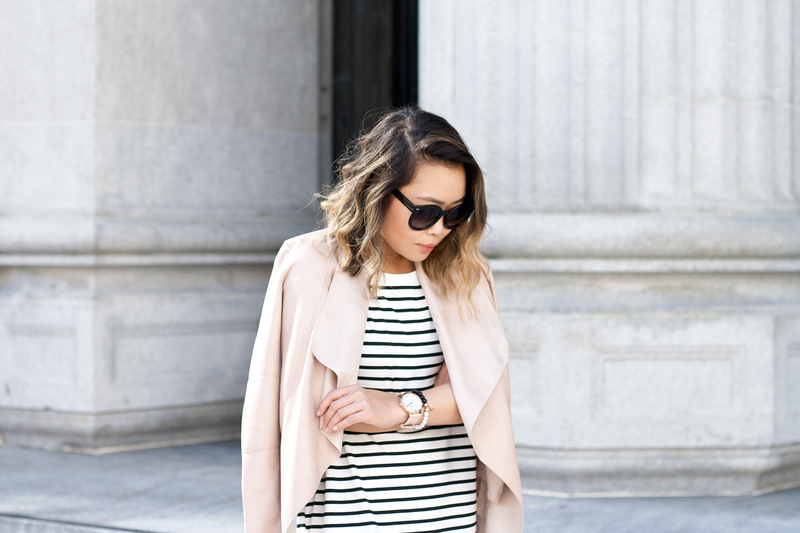 Striped tee dress c/o Azalea. 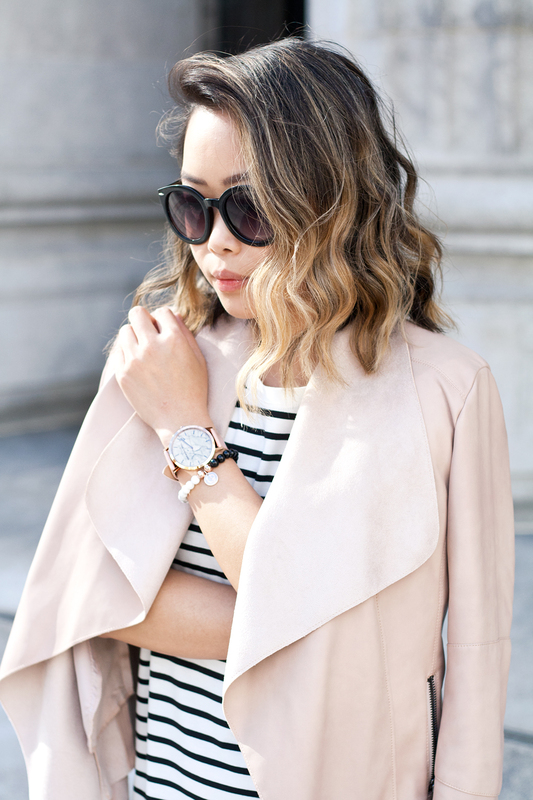 Blush moto jacket by Bar III c/o Macy's. Blush leather oxfords c/o Everlane. 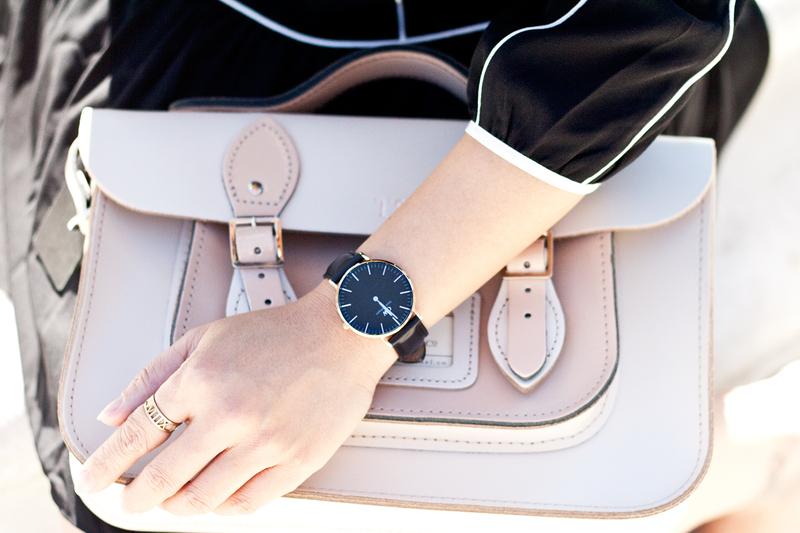 Brighton Marble watch c/o Christian Paul. Distressed moto jeans from PacSun. Suede leather Chelsea boots from Aldo. 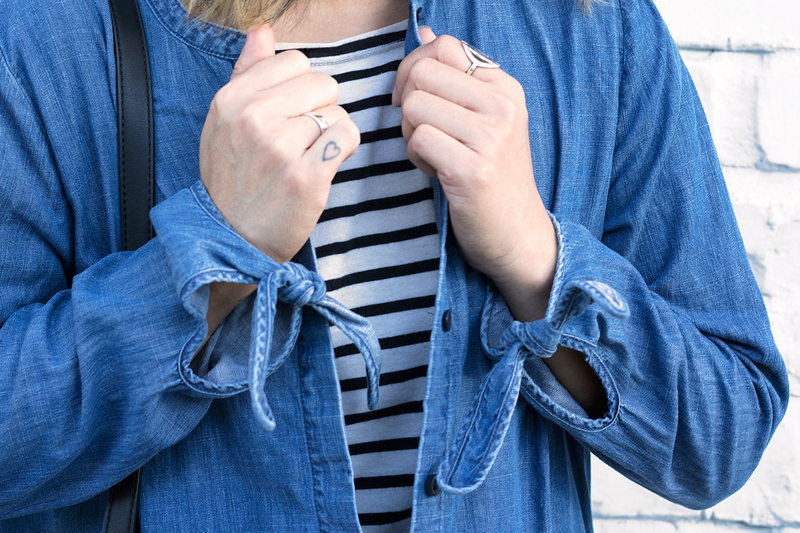 I love a good denim top, even better when it has darling sleeve details. This top from Madewell is so versatile, button it all up or wear it open, the possibility is endless. 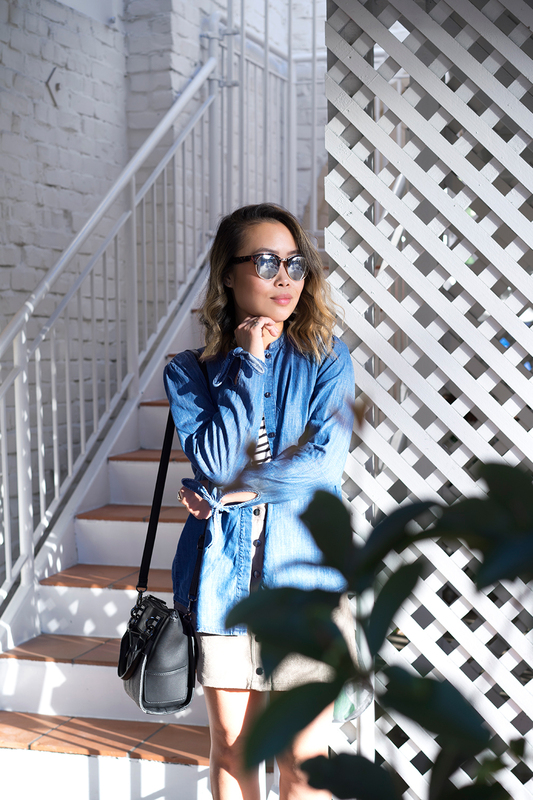 It was a surprisingly warm Sunday and I tracked down to Palo Alto to have a day full of brunching, shopping, strolling and dining with my good gal Shirley. 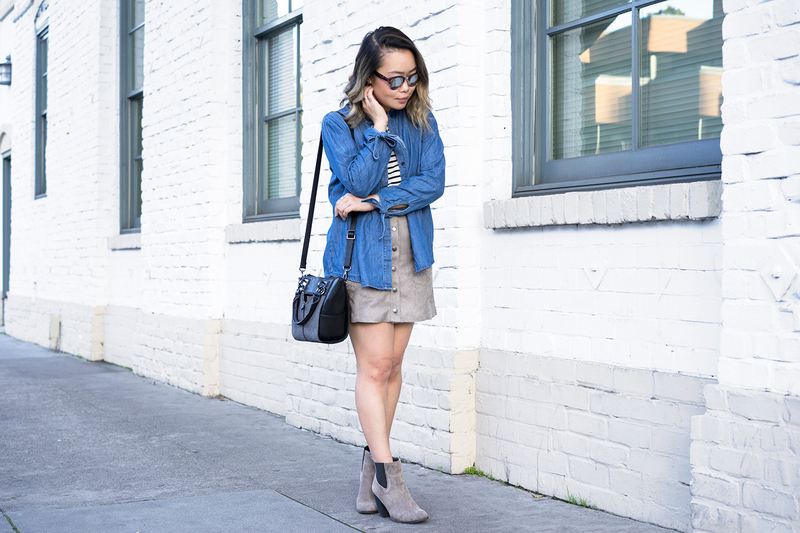 I layered a striped tee under the denim top, paired with a cute suede skirt by BB Dakota and matching booties. Oh my, don't you just love this top and how the sleeves tie into a little bow? I absolutely adore it! 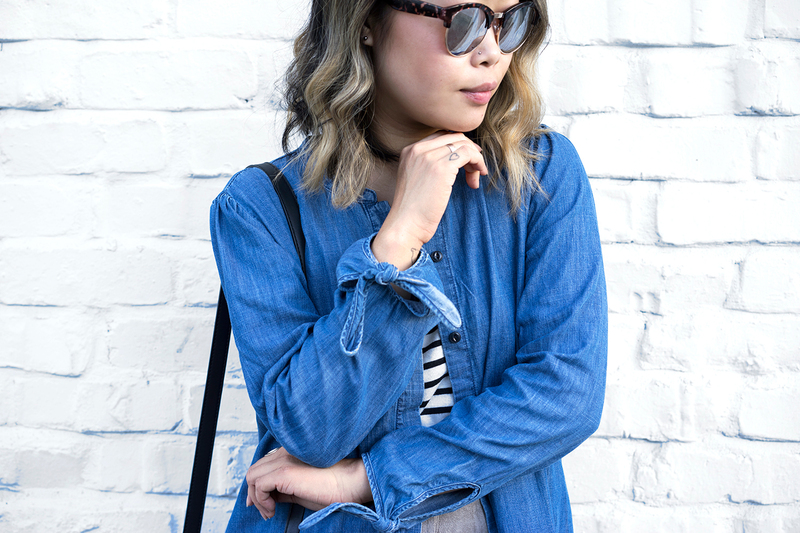 Denim tie-sleeve top c/o Madewell. Striped tee (old) from F21. Suede mini skirt c/o BB Dakota. Taupe suede booties (old) c/o Sole Society. Mini satchel (old) c/o Danielle Nicole. 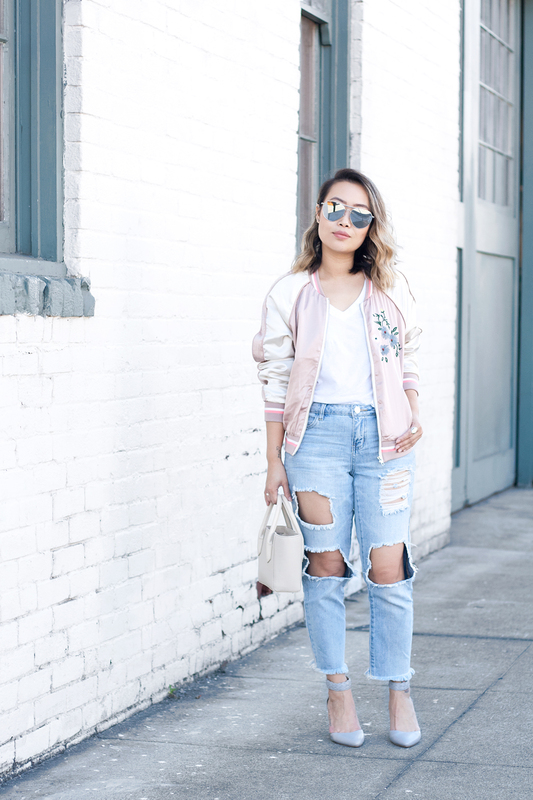 Forget about boyfriends this Valentine's Day, it's all about the boyfriend jeans instead! Is it just me or is it difficult to find a pair of denim that is perfectly distressed yet also fits like a dream? 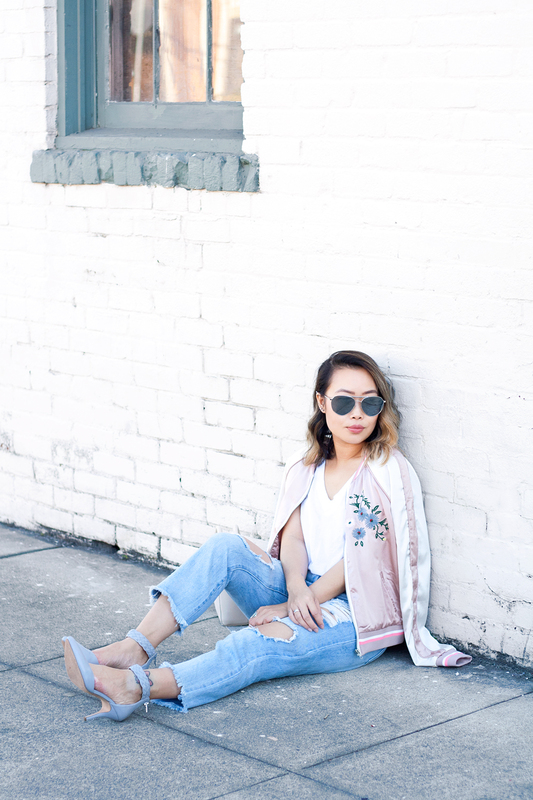 Look no further because these ripped jeans from Charlotte Russe are amazing! So great that a plain white tee is all you need to style them with. 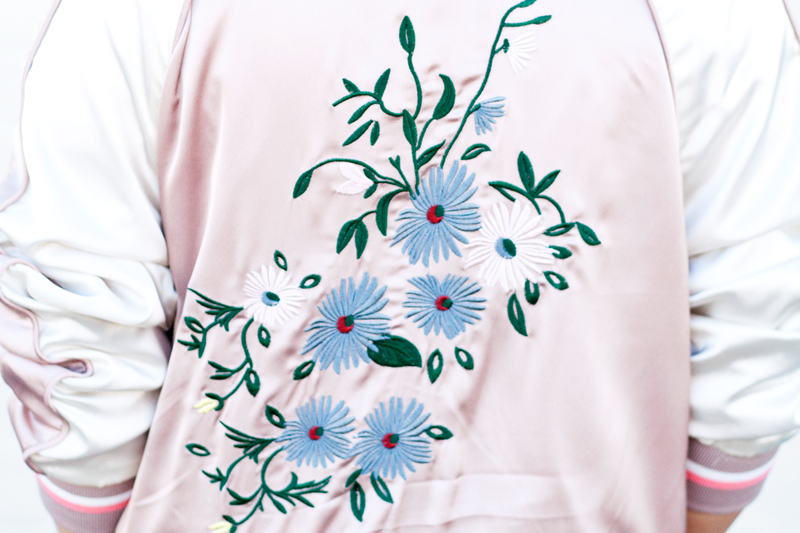 But you know, it's still February and a bit chilly so I threw on this silky bomber jacket with the cutest floral embroidery. I am loving this boy-ish yet feminine combo, what are your thoughts? Distressed boyfriend jeans c/o Charlotte Russe. 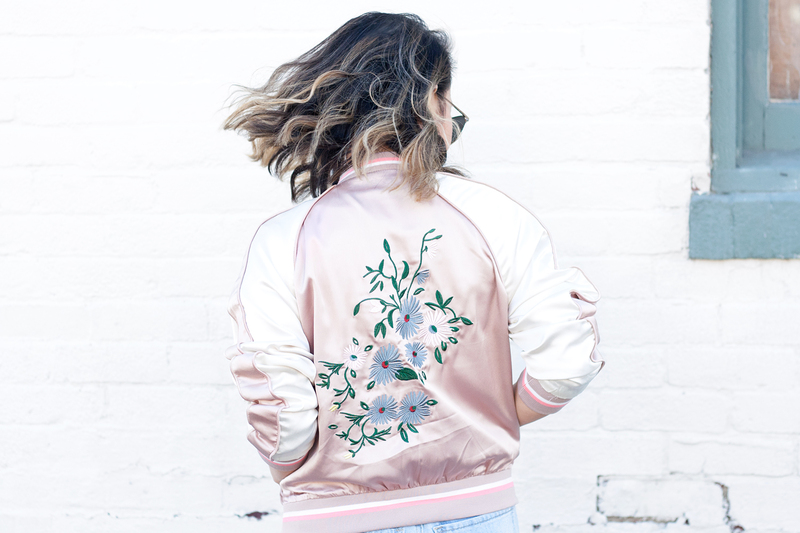 Embroidered floral bomber jacket c/o Charlotte Russe. Light gray heels (old) c/o Sole Society. Tiny tote c/o Dagne Dover. Reflective aviator glasses c/o Charlotte Russe. Is Spring here yet? As much as I love the rain, this entire month of gloomy weather is getting annoying. Luckily, the weekends have been decent. We took a stroll down to the lake last Sunday and shot some photos. 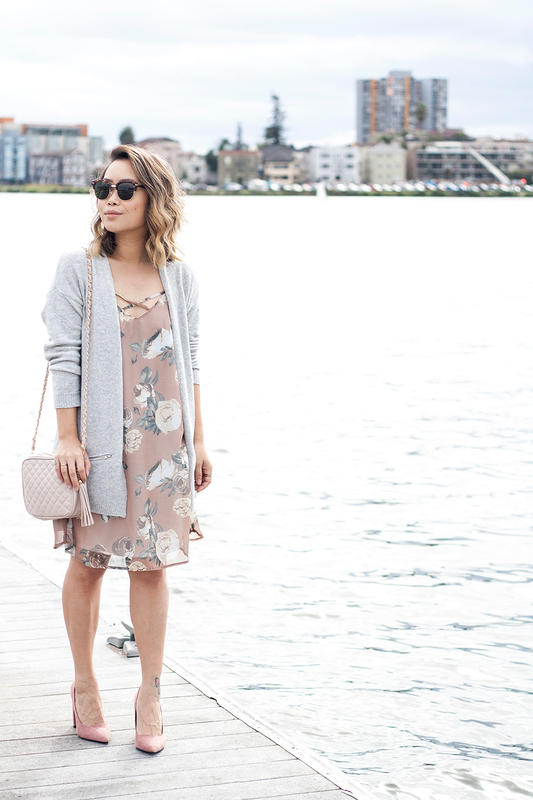 I am wearing muted florals to brighten things up a little but kept the look fairly neutral. I absolutely adore this dress... the strappy details, the flowy silhouette and of course the darling floral! 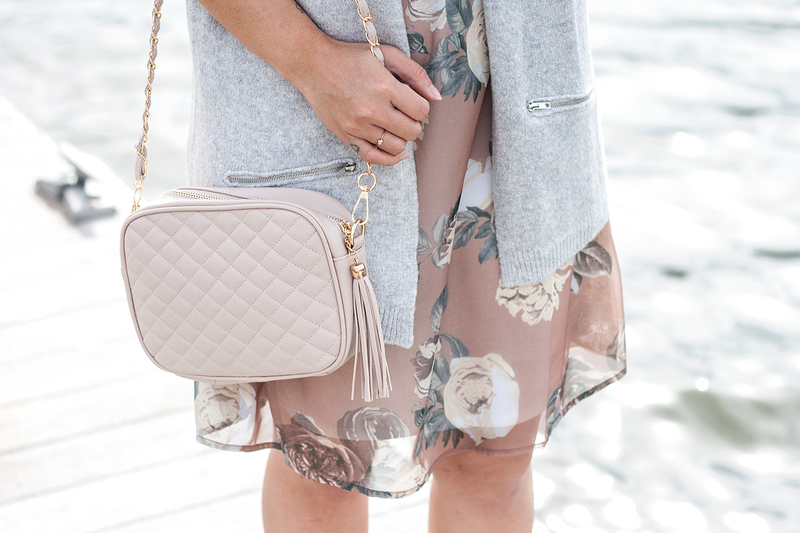 I styled it with a cozy cardigan, quilted purse and a pair of heels in the cutest shade of mauve pink. Now, rain rain please go away! 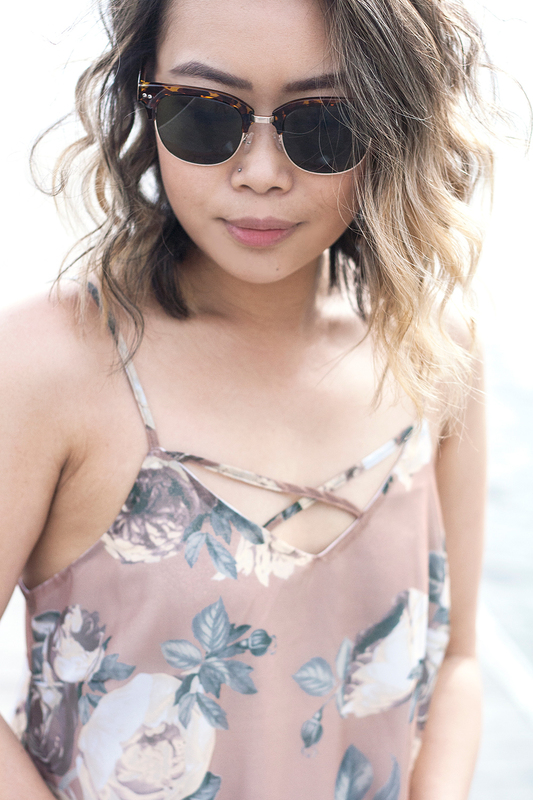 Muted floral strappy dress c/o Charlotte Russe. 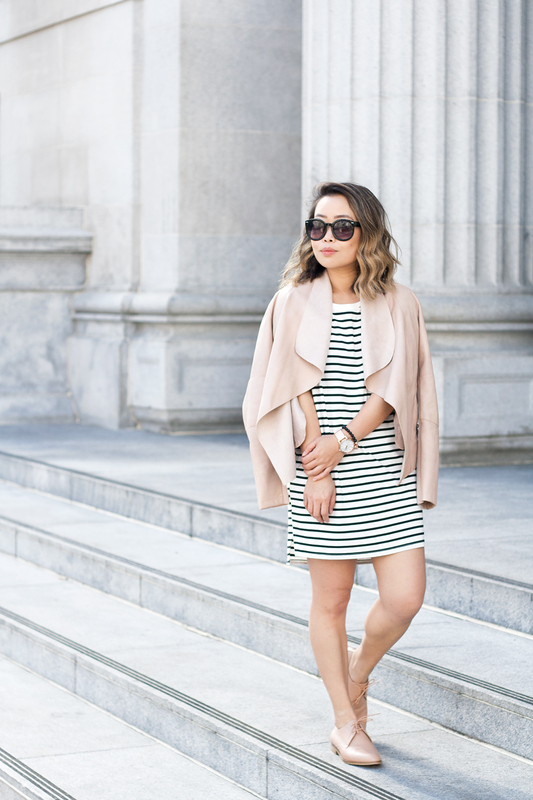 Heathered knit cardigan c/o Charlotte Russe. Quilted purse c/o Charlotte Russe. Mauve heels c/o Charlotte Russe.